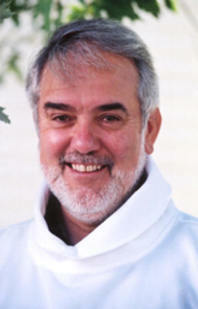 Father McAlear, a native of Boston, Massachusetts, entered the religious order of the Oblates of Mary Immaculate in 1960. He studied in Rome and was ordained there in 1970, after receiving degrees in Philosophy (Ph.L.) and Theology (S.T.L.). He returned to the United States, where he taught high school and received another degree in Religious Education (M.A.). In 1972, Father McAlear became involved in the Catholic Charismatic Renewal and he entered into the healing ministry in 1976. His ministry and work have brought him to every part of the United States, Asia, South America, Canada, Australia, New Guinea, Guatemala, Italy, France, Portugal, and Scotland. Father McAlear has been a member of the Association of Christian Therapists since 1977, and a past director of Our Lady of Hope Center in Newburgh, NY. In Newburgh, his charismatic work included healing prayer along with a strong outreach to the poor and needy in that area. Father McAlear was subsequently appointed as the Vocation Director for the Oblates of Mary Immaculate. In this capacity he was stationed in Washington, D.C. where for ten years, he recruited young men for the priesthood. He is now assigned to devote himself full time to teaching and the healing ministry. The healing ministry is rooted in a scriptural understanding that the human individual needs to become whole. This healing is both mental and emotional, and is blessed through prayer which touches the hearts of those in need of God's love and compassion. The Blessing of the Holy Spirit imparts a gift of understanding that both heals and renews the wounded heart. Christ, our Healer, frees the heart to love and to trust while renewing the inner spirit, bringing fresh hope and new life. In celebration of the 2000 Jubilee, Father McAlear said: "The central mystery to all Christianity is the Incarnation. The work of salvation and the fruits of the Spirit flow from this one fundamental truth of the Word made flesh. Jesus is Emmanuel - God with us. The Eucharist is His continuing presence in our midst." This insight permeates all of Father McAlear's teachings. Those who come to hear Father McAlear consider his work to be truly a "Ministry of Hope and Healing," and his teaching gift, to be that of someone who brings "the Word of God--the Voice of Jesus Christ" to the hearts and minds of many individuals. Father McAlear feels he was called to be a priest in order to bring this message of God's love and peace to believers who earnestly, and sometimes almost desperately, seek the "Spirit of Truth." Those who listen to Father McAlear's teachings are encouraged to seek holiness in life, a stronger faith, and a renewed depth of sincerity in their belief in Christ. The Oblates of Mary Immaculate, a worldwide congregation, is dedicated to bringing the Good News of Jesus Christ to the poor and disadvantaged. Only a living faith in Jesus Christ can bring true hope to the suffering. The healing ministry is a way of proclaiming the word and work of Jesus. Saint Eugene de Mazenod, the founder of the Oblates of Mary, left this challenge to his Oblate Community: "Leave nothing undared in proclaiming the Kingdom of God!" The Healing Ministry is a dramatic proclamation of Christ's living presence in the world today; it is a real experience of His love. As such, it continues the Oblate tradition of ministering to the hurting people in the world. Father believes that the greatest healing comes through Eucharist. Therefore, during Mass, he instructs those who receive the Holy Eucharist to enter into the healing process by taking their needs and infirmities to the Lord at the very moment they receive the Eucharist. After the liturgy, the healing service begins. The Holy Eucharist is brought onto the altar for exposition during the healing service during which attendees pray and adore the Lord. Father McAlear then gives the anointing and blesses and any individual who wishes to come forward for prayer. With the Holy Eucharist within us and the Holy Eucharist exposed before us we are embraced by the Merciful Heart of Jesus. In this embrace we are all united and the spirit of a loving community is created. The response to this experience differs for each individual and have included such reactions as openness, awe, a desire to be healed, good will, inspiration, praise, contrition, petition, forgiveness, thanksgiving and more. After attending Father McAlear's healing mass, many individuals experience emotions that are sometimes too powerful to express in human language; all experience a deep peace.